I read. I write. I blargh. 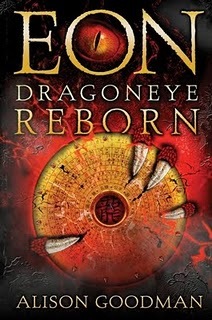 I didn’t know anything a bout Eon: Dragoneye Reborn or author Alison Goodman when I picked up the novel, but it surprised me in a good way. Instead of the typical European feudal system, Goodman looks to the Chinese Zodiac to shape her story world. Each year, one of twelve dragons comes to power and chooses a new apprentice who will become Dragoneye and harness the dragon’s magical power. Title character Eon is actually Eona, disguising herself as a boy in hopes of becoming the next Dragoneye. In addition to her gender standing in the way, Eona is also crippled. It is the Rat Dragon’s turn to choose an apprentice but, in a surprising turn, he isn’t the only dragon who appears to choose an apprentice at the ceremony. Author Alison Goodman lives in her hometown of Melbourne, Australia and teaches writing at the postgraduate level. Eon was first published in Australia under the title The Two Pearls of Wisdom. In the US it took the title Eon: Dragoneye Reborn, and then Eon: Rise of the Dragoneye in the UK. It has been published in thirteen countries and ten languages, so far. Whatever the title, Goodman’s story world is vivid and engaging. I couldn’t put the book down and when I turned the final page I wanted more. The title character had more depth than I usually find in young adult novels. Her physical, emotional, and external conflicts paralleled and complimented each other seamlessly. Even though the story focuses primarily on the identity struggle of a young woman, the external plot has plenty of big-picture consequences that up the stakes. In addition, Goodman deserves praise for two of her supporting characters. Eon’s friend Chart is endearing, devious, and also handicapped. Lady Dela is tenacious, brave in more ways than one, and also transgendered. Both characters contributed to the plot as more than mere gimmick or novelty. I’m sure the inclusion of these characters will draw criticism from some, but I think this is the kind of writing that helps to break down stereotypes, promotes tolerance, and teaches open minded thinking. Thumbs up for Goodman on this one. Fans of Tamora Pierce should dig Goodman’s story world. Eon: Dragoneye Reborn appeals to teens and adults alike. READERS BEWARE: this is part one of two and the second part isn’t out yet. I don’t say this to dissuade you from reading but to save you a frustrating and futile rush to the book store when you finish reading Eon. Goodman is on the verge of leaving too many threads dangling, but fortunately for her the threads are rich and captivating. If rumors are to be believed, the sequel is coming out this year. So if you want to avoid frustration, wait to pick up both volumes at the same time. Or you can be like me and wait eagerly on the preorder list.